Down to earth solid colognes by the Fury Bros.
Just before Christmas, I received a number of products from the folks at Fury Bros. These guys produce a few essentials: Body Wash, Solid Colognes and Candles. Shout out to Jeremy for making this review possible. What attracted me to this brand was the early 20th century branding and labeling. It is perfectly done. The products are also items you might easily imagine as coming from that period as well. The candle and solid colognes, without hesitation. First off, the selection and originality of the aromas. After years of working with scents from the big players with their spray colognes, I was ripe for something new. I say something new, but I should say: something from a simpler time. Most solid colognes are made in artisanal manners by people rediscovering what life use to be and who are letting their noses embrace the beauty and purity of a few good key ingredients. A scent does not have to be composed of 35 fragrances to be appreciated. In fact most of us will not be able to distinguish all of the elements. But we can certainly identify and appreciate 2-5 fragrances blended together. Having an honest and pleasant aroma goes a long way. Our sense of smell is apparently one of the strongest when it comes to accessing our memory palace. Everyone of us probably has a positive memory of smelling bake goods. May it be bread or cake or cookies. These are simple aromas, but they also trigger very positive vibes in us, because we associate that next moment; when we get to eat those delicious smelling goods. Eating fresh bread or cookies is generally speaking a happy moment. The guys at Fury Bros., have kept things uncomplicated, both in their presentation and delivery. As mentioned above the packaging looks like items that would have been on the shelves of a 1940’s general store. The delivery is along the same line; short ingredient list composed of things you recognize and could find in a grocery store. In this day and age where so many chemicals are guilty of causing us one ailment or another, there certainly is a point in wanting to take a step back and keep it simple. 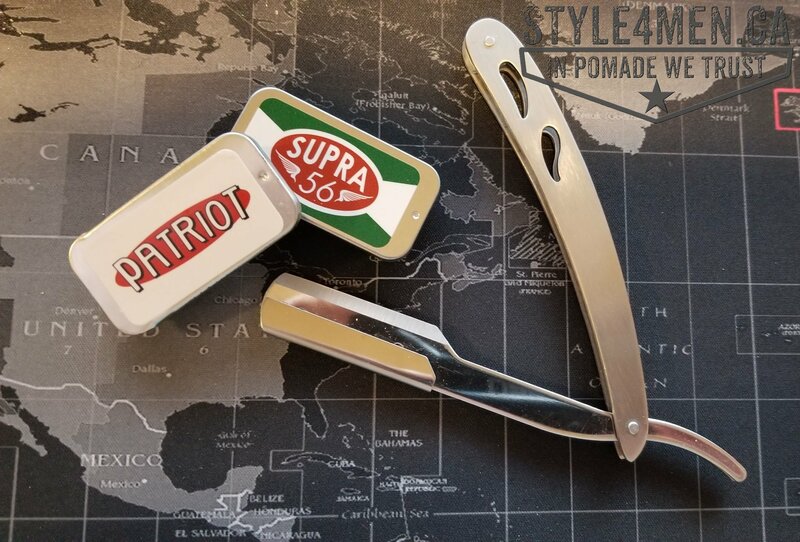 These little thin can are small and light and will easily travel with you throughout the day and be ready when you need a touch up. There are very few ingredients, all of which are natural. The beauty of this is that folks with allergies or skin reactions to the chemical party that are traditional alcohol based cologne sprays, will be able to enjoy them without issues. Because the foundation of the solid cologne is grapeseed oil and beeswax, your skin will appreciate it as well. 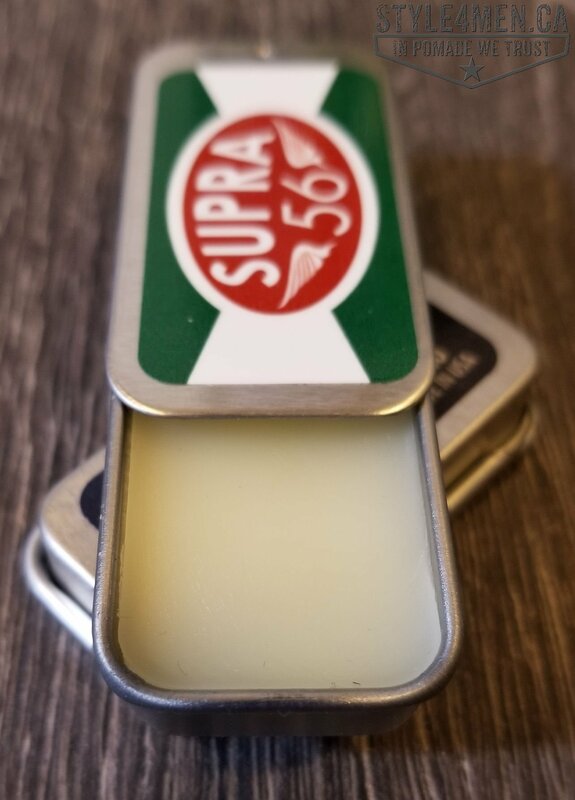 Lastly and this might not be very obvious up front because of the small size of the can, but that small can of wax will last you an incredible amount of time. You will need very little to perfume yourself. You are also not wasting 50% of the cologne when spraying in the air. You will also avoid over-doing it by spraying too much on. Nobody likes that guy. 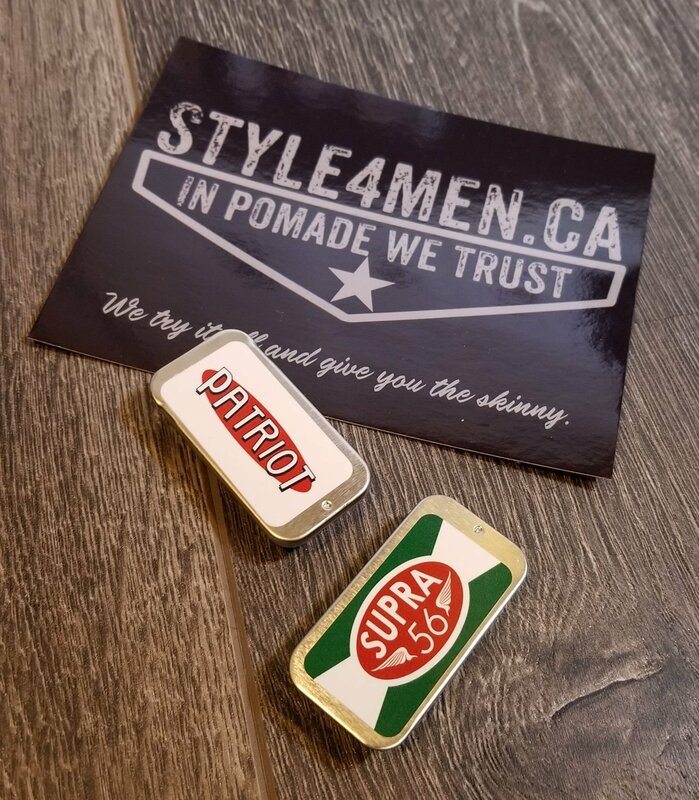 All and all, the solid cologne delivery method is just a flat out winner for us at Style4men.ca. 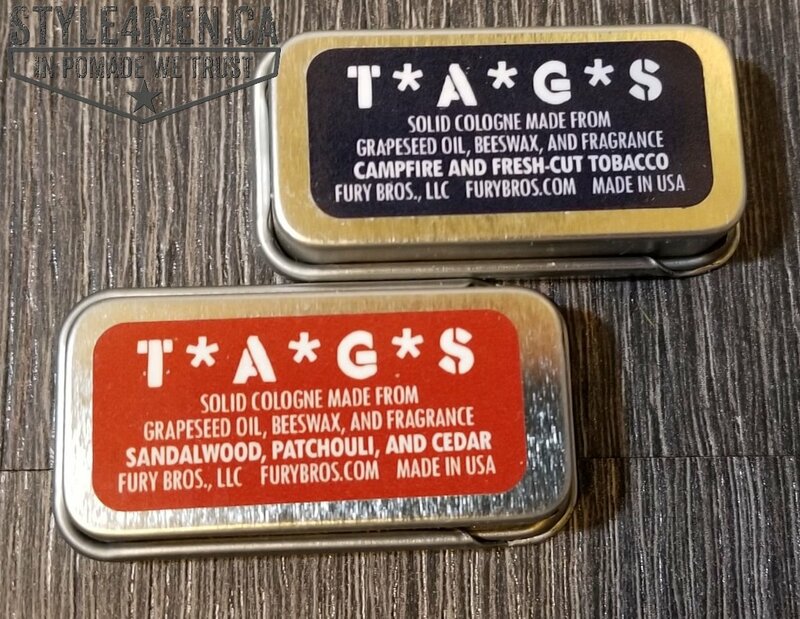 So what about the scents offered by the Fury Bros. 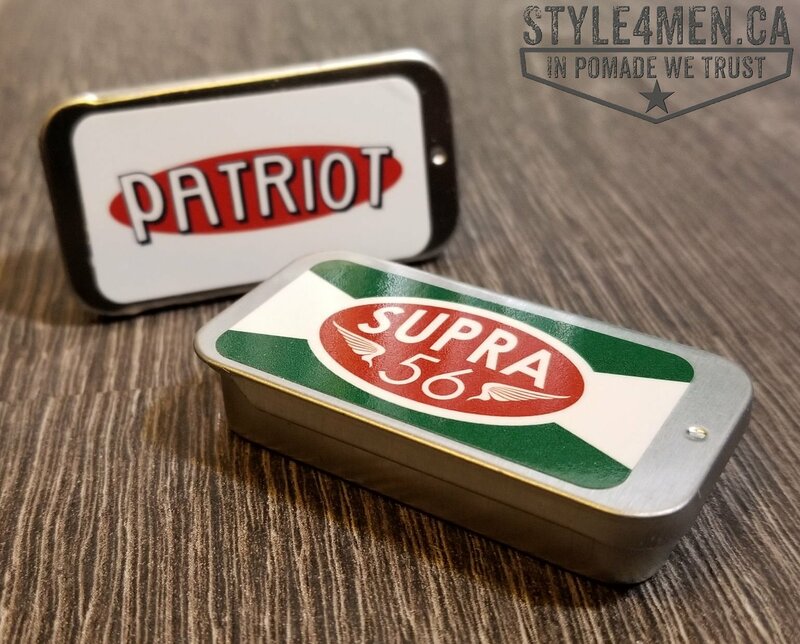 I have the Supra 56 and the Patriot to work with. 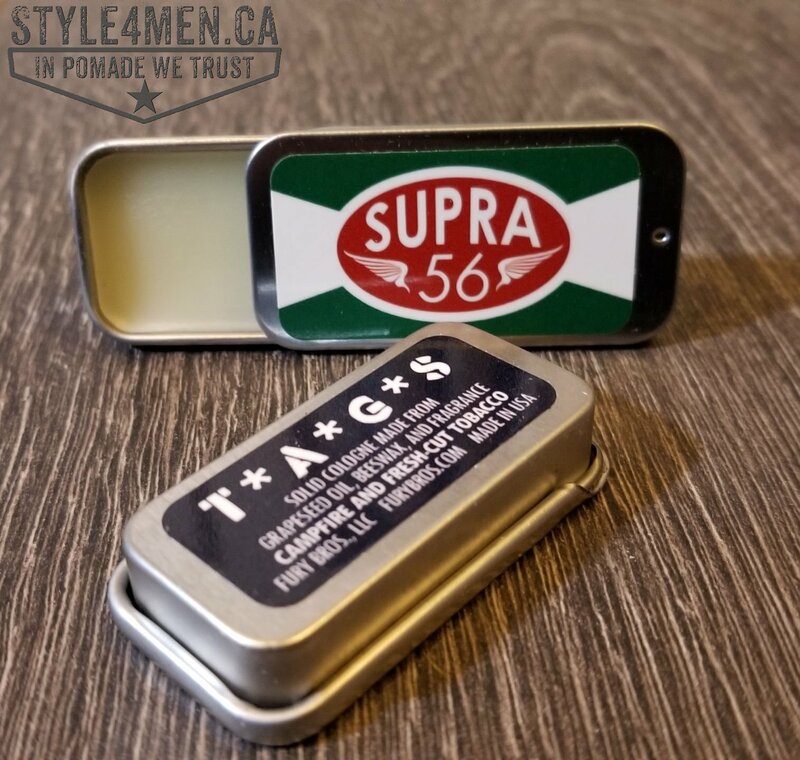 The Supra 56 is perhaps my favorite of the two, simply because I like sweet fragrances. Sandalwood is typically very sweet smelling, but it is not dominating here. The patchouli is not a scent I like on its own, but it is often blended among other elements to balance things out. Cedar is recognizable but in the background. Together they make a very nice combination. I can definitely associate an evening out in the woods when opening the “Patriot”. The fresh-cut tobacco is perhaps the dominating element here. 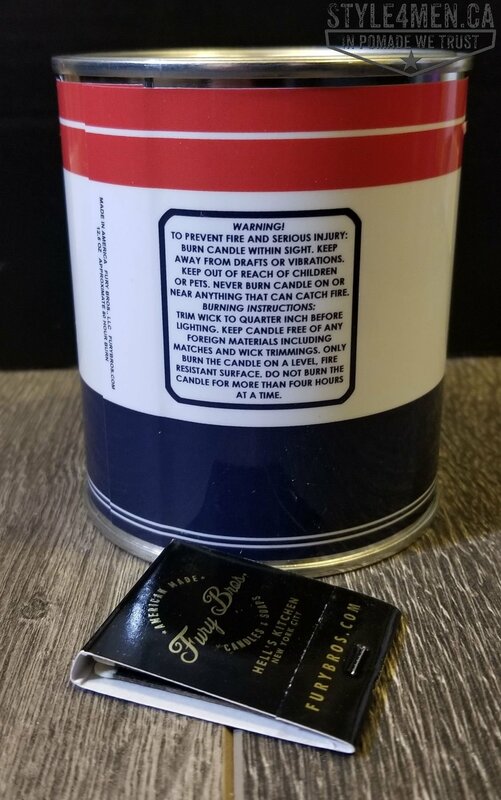 But let’s be clear tobacco does not smell like cigarettes or an ashtray. It is more of a rich-earthy plant aroma. Pleasant and soothing. I will also venture and say that fresh-cut tobacco also smells different than dried tobacco. This second aroma is that of cigar and pipe tobacco. Basically what you might recognize when walking into a humidor. What about putting these scents on your body and who wants to smell like a tobacco plantation or a campfire? You would be surprised. I have been sporting a tobacco scented pomade for the past few days and people are commenting on how much they enjoy the scent. It’s about embracing the simpler things. Since most of us live in cities that don’t always have the best to offer your nose, these scents will restore some sort of harmony in your mind by creating a balance between your urban self and your rural persona. 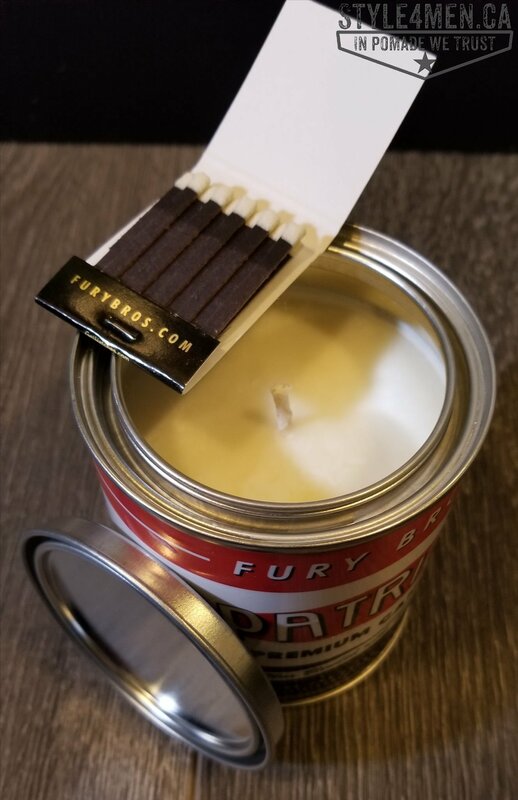 The scented candle in a can is again another authentic old-school item. 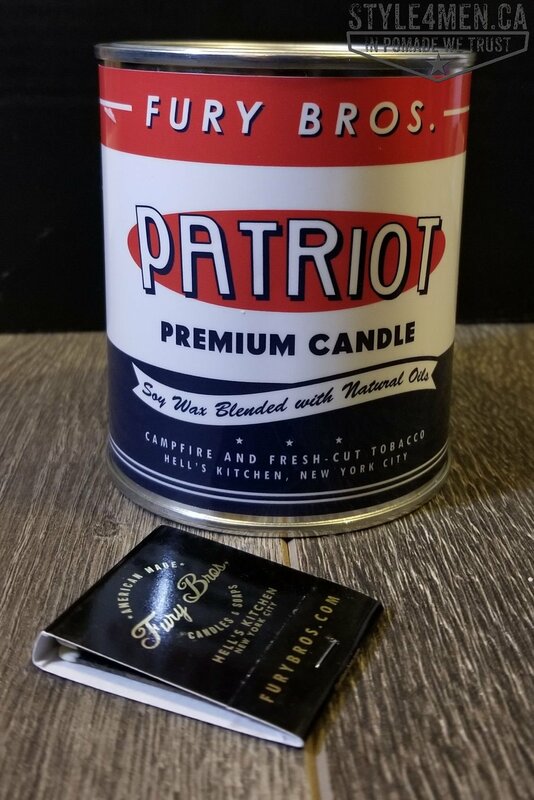 It’s literally a candle in a proper metal can. The whole thing has nice weight to itself and you will need a knife like tool to pop the lid open. The aroma is well done. I am not a big candle kinda guy, but I certainly appreciate the whole spirit behind cleansing a space every now and then. A scented candle does this very nicely and the aroma won’t make you feel like you should be wearing a flower print shirt. Last but not least the guys at the Fury Bros. also sent me their impressive body wash. But instead of overwhelming everyone with one giant review, the body wash will get it’s own time in the light. Stay tuned for that review! In closing, the solid colognes and candle from the Fury Bros. are impressive in their simplicity. Down to earth pleasant scents and easy to work with. If you need to take things down a notch and get back to basic without moving to the woods, these products are nice break.